Anderson, Indiana provides its residents with the perfect place to live, work, and play. Anderson offers safe neighborhoods to live in and a thriving downtown to work and play. Action Pest Control is a local pest control company that is dedicated to helping you ensure that your home is kept free of pests like mice, ants, spiders, termites, and bed bugs that also enjoy living in Anderson. Through our expert pest control services, you can be sure that you and your family will be the only ones living in your Indiana home! What is the best way to keep spiders from spinning webs in the corners of your home, stop rodents from nesting behind walls, and prevent ants from lining up for dinner in your kitchen? A year-round home pest control service of course! Pests can cause damages and become a huge nuisance inside of Anderson homes whether the weather is very warm or freezing cold; by implementing a year-round pest control service, you can get rid of current unwanted guests and prevent new ones from moving in! Action Pest Control provides a wide range of home pest control services to choose from: Essential pest control program, Advanced pest control program, Complete pest control program, and our most comprehensive - Premier pest control program. Our Premier pest control service is an affordable, effective, safe, year-round management solution for over 40 household pests including termites, and stinging insects within 40 feet of your structure. You have discovered that bed bugs have made their way into your Anderson home. You figure an easy solution is to get rid of all mattresses and box springs in your home and purchase new ones. Problem solved, right? Wrong! Despite their name, bed bugs don’t just live and hide in mattresses and box springs. Their flat bodies allow them to hide in the cracks and crevices of walls, wooden furniture, underneath floors, and behind wall outlets. The only way to completely eradicate bed bugs from your home is with the help of a bed bug control expert. Action Pest Control provides our customers with fast, effective bed bug treatments. The initial step to ridding your home of bed bugs is to have a bed bug inspection completed by one of our trained bed bug detection dogs. They have been specially trained to very accurately identify any adult bed bugs, larvae, or eggs that are located in your home. If an infestation is discovered, we will then provide treatment through our heat remediation services. Heat remediation provides customers with an eco-friendly, non-invasive solution to kill all adult bed bugs, eggs, and larvae. You will find that heat remediation provides immediate results, requires only one day of treatment, provides immediate re-entry, and is extremely effective without the use of chemicals. Words that are commonly used to describe termites include, silent, difficult, damaging, destructive, costly, and invasive. As you can probably guess from all these adjectives, termites are a tough pest that require an experienced hand in order to quickly, safely, and completely get rid of them from a home or property. Action Pest Control understands termites. We understand how damaging they can be. We understand how much stress they can cause you, and we understand how to eliminate them from your Anderson home. 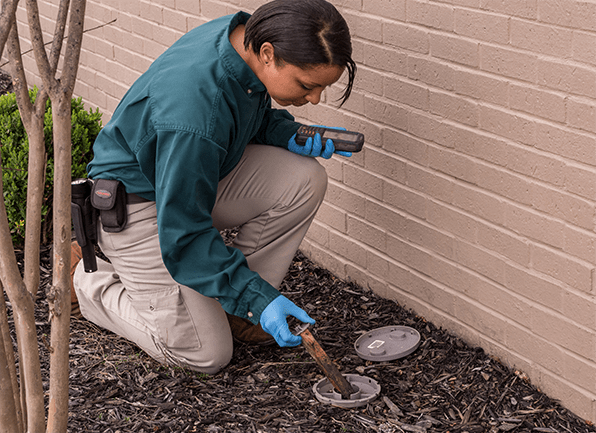 Our five-step termite control system provides our customers with comprehensive treatment and control. The first step includes a comprehensive inspection that is performed by one of our licensed professionals. The second step provides treatment through the use of Termidor®, a highly effective product that gets rid of termites through both ingestion and direct contact. The third step is a three-month termite elimination inspection; the fourth step is an annual termite inspection to make sure that your home is staying termite free, and the final step is our money back guarantee and damage warranty. Action Pest Control can also eliminate and control a termite infestation through the installation of the highly effective and environmentally friendly Sentricon® Termite Colony Elimination System. This system works through the placement of discrete bait stations in the ground around your home. For more information about this treatment option, contact us today. Action Pest Control is dedicated to providing all of our Anderson, Indiana, customers with effective, modern, safe, affordable solutions to any pest problem. We understand that all of our customers have different needs; this is why any of our services can be customized to your unique pest situation. Along with providing outstanding pest control services, we pride ourselves for being a pest control company that you can fully trust. We are a QualityPro certified company that employs over 70 pest management professionals. All of our professionals are friendly, dedicated, highly trained, and state certified. Whatever the pest problem may be in your home, Action Pest Control has a solution for your Anderson property!